This recipe was supposed to be a copy cat recipe. But then I got a little too creative, and it sort of became it's whole, own, new thing. Which is totally awesome and delicious. And really...this just means I get to make another recipe to be the copy cat in the future. In case you're curious, I was trying to copy cat the gooey caramel pie from O'Charley's restaurant (a place near our house that we frequent and which has the GENIUS promotion of Free Pie Wednesdays). 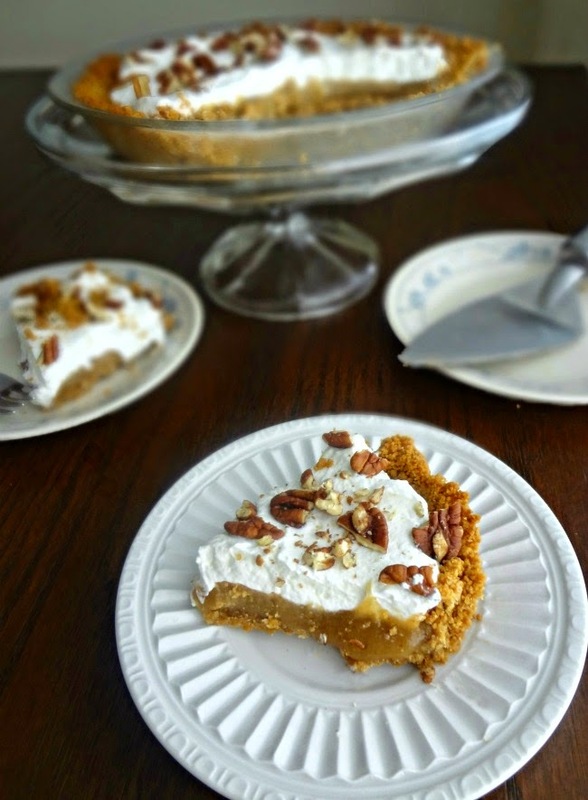 I did want to add some oomph to the pie initially by making it a gooey salted caramel pie. 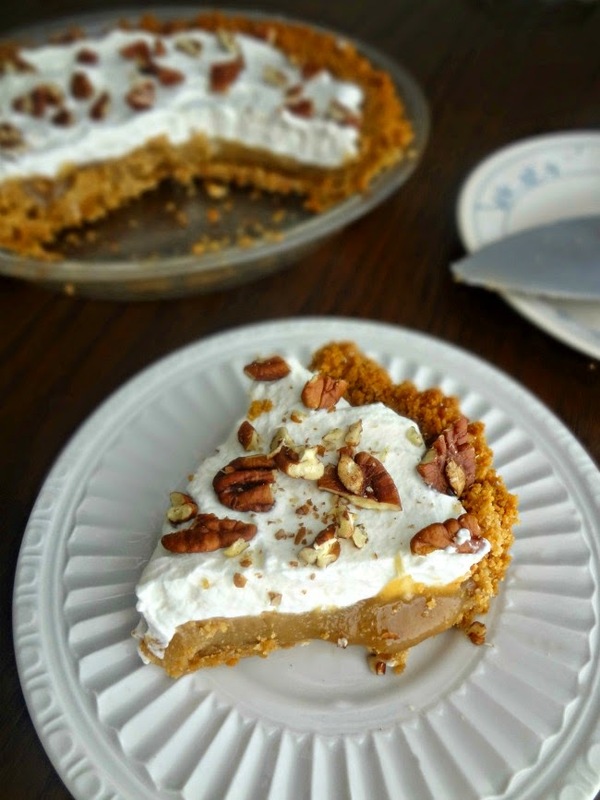 But then I went a step further and, after seeing a recipe for peanut butter caramel and thinking OH MY YUM, made it a peanut butter caramel pie. And then I got lazy and saw a recipe for microwave caramel and...you get the idea. This is how we ended up with this pie. 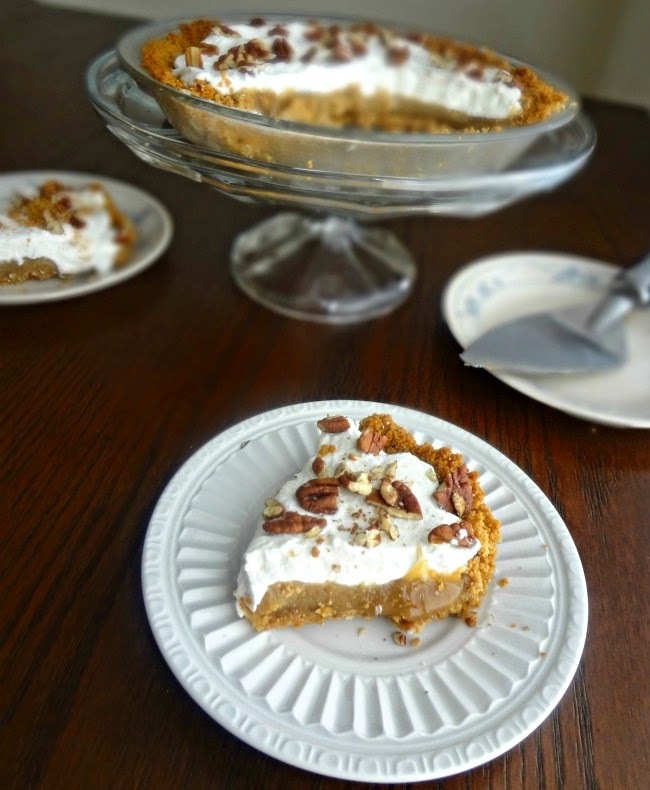 A delicious peanut butter graham cracker crust (my go-to graham cracker pie crust recipe, in fact) is topped with a layer of super easy to make (remember? lazy. Microwave caramel sauce. FORREAL) peanut butter caramel (which is super sweet but also rich and peanut buttery, and thusly has that delish salty element as well), some salted whipped cream (which I thought was genius but is actually kind of weird but, luckily, worked in this pie) and then some pecans because they're fun and tasty and were on that original pie. PEANUT BUTTER FLAVOR TO THE MAX. Sweet, salty, rich, gooey, crunchy, luscious....just....mmmm....ok? Microwave peanut butter caramel adapted from cookies and cups and use real butter. In a medium, microwave safe, glass bowl whisk together 1/4 cup peanut butter, brown sugar, and 1/2 heavy cream until smooth-no lumps! Stir in salt and 1/2 tsp. vanilla. Let cool until warm and thickened. Grease a 9" pie plate with butter and preheat oven to 350F degrees. Make 1 and 1/2 cups graham cracker crumbs in a food processor (or just crush in a ziploc bag). Add melted butter and 2 tbsp. peanut butter to the food processor (or use a fork to combine in a bowl) and pulse until combined and moistened. Press the moistened graham cracker crumbs evenly around the sides and into the bottom of the buttered pie plate. Bake 10 minutes until set and golden around the edges. Let cool. 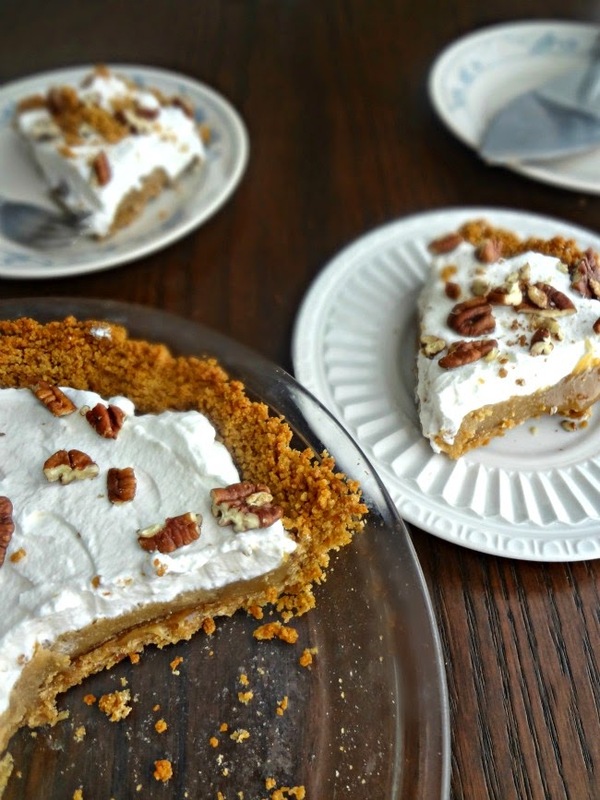 Once the crust and caramel have cooled to just warm pour the caramel into the graham cracker pie crust. Once the entire thing is completely cooled to room temperature cover with plastic wrap and place in the refrigerator overnight, or for at least 4 hours. Place a small glass bowl into the refrigerator to chill, as well. Before serving (or once the pie is chilled) make the whipped cream. Pour 1/4 cup heavy cream into the chilled bowl and beat on medium-high speed (or by hand with a whisk) until it thickens and soft peaks form if you bring the beaters or whisk up. Add powdered sugar, cornstarch, salt, and 1/4 tsp. vanilla extract. Continue beating until stiff peaks form. Spread over the chilled caramel pie. Sprinke chopped pecans on top, if desired. Cut and serve! (Store any leftovers, covered, in the refrigerator for up to 1 week).